Down in deepest Padstow, Rick Stein's new chippy is fish and chip heaven. In a white tiled shop on the harbour front, you can buy haddock and chips, plaice and chips, scallops and chips, sea bass and chips and monkfish and chips with freshly made Goan curry sauce. There's posh! You can have your fish battered or grilled, eat in or out, have a crabcake, a pint of prawns or a chip butty. But the one thing you can't have is fresh cod and chips because Stein, the food hero who champions the native, the fresh, the artisanal, the noble, the cream, the crop and the very best of British food in his BBC television series, is selling frozen Icelandic cod in his chip shop. Rick! How could you do this? "Dead easily," he says. "We are into sustainable fishing of cod and Icelandic cod is sustainable and that is more important than anything. But actually, the quality is there, too. We tested everything and Icelandic cod are big so you get the lovely flakiness of cod and you get the nice, thick fillets that are the secret to good fish and chips." Everything else in the chippy is fresh off the boats, although Stein may soon introduce frozen haddock, as the local ones are "quite small". His flagship restaurant has fresh cod on the menu, but in a chip shop where he expects to sell more than 100 stones of cod a week, the conservation issue has left him no choice. "It's just not clever to do anything else," he says. "I can't be seen to be selling local cod here, in view of the current problem we have." But what will he say to detractors and purists and food pseuds who will be out to batter and grill him when they hear the news? "I will say, you don't understand, so get stuffed!" he cries. Stein is in an ebullient mood. The sun shines over Cornwall, light glitters on the estuary and friends and news crews are piled inside the chip shop on its grand opening day. Our food hero has donned his white chef's jacket - a ceremonial robe, really, as these days, he cooks only on television, never in his own restaurants - and moves easily among the crowd. His wife, Jill, is at his side, smiling and looking pretty in cream leather. Although the couple have been estranged since Stein's relationship with an Australian publicist in 2001, they agreed back then to carry on working together. "We're both bloody-minded. We both thought, right, we are not budging on the business after all these years and hard work. It's a family business, we've worked with some of the staff for years," says Stein. "I thought: I am not buggering their lives up just because me and her are not seeing eye-to-eye." "Rick's always wanted a fish and chip shop," Jill says, pleasantly. If there is any strain behind the smiles and this show of togetherness, it is very well hidden. Stein looks very happy and he says that is because this is what he loves doing most. "The restaurant business is far and away the most important part of my life. I love doing the television shows, but this is where it's all at for me," says Stein. He has been a successful restaurateur for 30 years - and it shows. Even in the chippy, the attention to detail is incredible. A new Dutch fish fryer churns away "like a giant combine harvester" near the counter, as the cosy aroma of hot dripping fills the air. There are bowls of pungent aioli and a chunky, freshly made tartare sauce that's delicious. "I know!" he enthuses, just like he does on his programmes. "Don't you just hate it when it's in those little squishy packets and it's just an afterthought when it should be a really lovely thing?" I do. And I have to admit that I used to find the telly Stein and his proselytising about squishy packets or tinned breakfasts or mealy sausages a little irritating, as he trucked up and down the country alternately despairing or being preachy about the state of British food. Then I started trucking up and down the country to write about the state of British food for this newspaper and now I'm even more of a preachy moaner than him. Now I know exactly what he feels when he's sobbing into a bowl of powdered soup on a wet lunchtime in High Street, Anytown. Never mind his OBE last year for services to tourism; the man's a saint! So we have a quick discussion about tartare sauce - what a pair of deep fried bores - and move on. In the chippy's 32-seat restaurant, customers will sit at scrubbed wooden refectory tables and perhaps admire the slate floors and granite surfaces before tucking into skate or John Dory or hake. Really, it couldn't be nicer here. Stein's Fish & Chips is simple. It is perfect. It is another successful collaboration between fishmeister Rick and designer Jill, which has resulted in Padstow being nicknamed Padstein because of the Steins' three restaurants, one hotel, two fabulously upmarket B&Bs, deli, patisserie, gift shop and, of course, the famous Seafood School, which Gordon Ramsay says is the only cookery course he can wholeheartedly recommend to anyone. They operate at the stylish and quality end of the market and have recently bought a 44-bedroom hotel in Newquay which they plan to demolish and rebuild, with an optimistic opening date of November 2005, although Stein now thinks that will be unlikely. So, it is big business indeed, with an annual turnover of pounds 4 million and a reputation for putting this little corner of Cornwall firmly on the tourist map. It is perhaps no surprise that Rick and Jill Stein decided to grit their teeth and carry on working together, even though there have been difficult moments. He now lives a bachelor life in a little cottage in Padstow, while she inhabits the family house up the coast at Trevone, which their three sons still call home. Stein says that the boys, aged 29, 23 and 18 are the most important people in his life, although it's difficult to shake off the impression that there are moments when he is bewildered at how family life has turned out. Last year, he said that divorce was not an option. Now, he says, it is firmly on the agenda. "Jill and I are talking about divorce. It is hard to get divorced or even talk about divorce if you are working so closely together on a number of things, but, on the other hand, I think it might draw a line under both our lives, and that would be a healthy thing to do." We meet the next morning at a quiet table in his Seafood Restaurant. Stein comes here most evenings when he's in town, slipping through the kitchen door unnoticed to check on the evening's progress. After this, he will extend the secret patrol to his other restaurants, always keeping a low profile. If he doesn't, he has to sign everyone's menus and progress can be slow. In tiny Padstow, he is recognised everywhere. Earlier, in the streets outside, a young couple had stopped to ask him if he would cook a vegetarian dinner for them at the Seafood. "We've only got seaweed, and that's not very nice by itself," he said, kindly, but they persisted. Eventually, he asked, not unreasonably, why they wanted to come to a fish restaurant so badly if they didn't like fish. Because of him, of course. Stein, 57, finds the whole concept of celebrity a difficult one. With his shy eyes and knotted hands, he is not a natural star, but his passion for his subject is the petrol that keeps his onscreen engine running and viewers tuned in. At first, he thought he'd do the telly shows because they might help his restaurant and, of course, that's what happened. 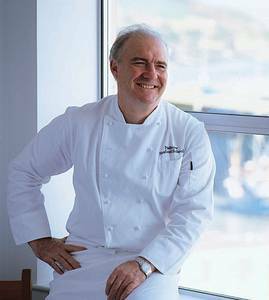 After Rick Stein's Taste of The Sea was first broadcast in 1995, the Seafood takings doubled overnight. Even then, Stein seemed an unlikely food hero, often looking quite fretful on camera, as if something else was on his mind. There are moments when he has a slightly mournful quality, but something about his rumpled, unmade persona and his ability to whip up a damn good Hollandaise or poach a turbot chimed with the British public. After all, we are an island nation. We love our fish. Stein book success followed Stein television success as more Stein restaurants and outlets were opened. As Stein travelled the world promoting the Stein brand, Jill Stein stayed in Padstow, keeping the business rock steady; she is the salt to his pepper, the knife to his fork. Without Jill, Padstein would have crumbled. And it nearly did. All went swimmingly, until Stein's relationship with an Australian publicist 20 years younger than him rocked the fishy boat two years ago. They were together. Then they weren't. Rick came back to Padstow, but not to Jill and Trevone. Life happened. And life moved on. The restaurants and hotels had bookings they had to honour, there were queues outside the shops. The Steins could fall apart - or carry on. "And we decided to carry on," says Stein. "Jill and I create much more together than we do apart. And we still get on. We have been married for nearly 30 years, you know, and I think part of the reason that stuff went wrong was that we ended up treating each other like business partners, rather than husband and wife. That's the problem with running a restaurant, really. It is so all-consuming. I am afraid if you are going to run a good restaurant, there won't be much of your life left and I fear that in my dotage, this is not something I am going to look back and feel great about." Stein will not go as far to say that his affair had a positive effect on his business - "that would be over-optimistic, there is a lot of unhappiness about" - but admits that the fact that he and Jill were working so hard instead of "spending more time away from the business enjoying ourselves together" has had a galvanising effect. Their loyal and long serving staff, fond of both Steins, "protect" Rick and Jill - I take this to mean keep them apart as much as possible - and the resulting boom in business is described by Stein as "the pearl in the oyster". At another moment, he talks poetically about the gracious bounty of the sea's harvest before remarking that, although his life in Padstow is usually very private, he was recently abused by a mussel picker's wife in a local pub who was enraged that he wasn't buying her husband's mussels. "But mussels grown in Shetland on ropes are the best mussels anywhere in the world," he says, with some urgency. "It's no good just going for local stuff just because it is local. You have got to have quality." What really drives him potty shrimp is when people complain about the prices in his Seafood Restaurant. "What do they think, that I go down to the water's edge with a bucket in my hand every morning? I pay the same for my fish as restaurants in London do," he shrieks. "The fishermen aren't going to sell it to me for a third of the price, are they?" It is true that any number of restaurants will buy sacks of frozen seabass fillets and stick them on the menu with a vanilla jus at pounds 23. It is true that even if you get a decent bit of fish in many restaurants, someone in the kitchen will overcook it and charge you handsomely for doing so. It is certainly true that the cod in Stein's chippy is frozen, but it's only pounds 4.75 for an ecologically sound fish supper. At the brilliant Seafood Restaurant in Padstow, main courses are around pounds 27, but the kitchen gets it right. Fish is expensive, but here you will get generous portions of excellent fish, perfectly cooked and beautifully served. Stein and his wife have created one of the very best restaurants in Britain. Yes, eating here will cost you. But look at what it has cost Rick Stein.